A downed electrical line coming into contact with a building or person can result in electrical shock or fire. 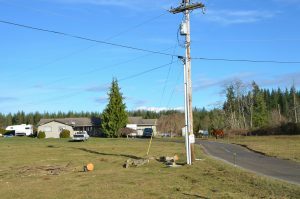 In order to protect buildings and the occupants inside them from injury or death, the National Electrical Safety Code (NESC) created clearance regulations for electrical lines that hang over or run next to buildings. The NESC, published by the Institute of Electrical and Electronics Engineers, is considered the industry standard for electrical safety regulations. Most state regulatory commissions adopt the NESC. The NESC publishes both vertical clearance requirements for electrical lines running over buildings and horizontal clearance regulations for electrical lines running adjacent to buildings. The vertical clearance regulation is dependent on whether or not the roof is available to pedestrians. If the roof is not accessible to pedestrians, the electrical line must be no less than 12.5 feet from the highest point of the roof. Whereas if a roof is accessible to pedestrians, the electrical lines must be no less than 13.5 feet from the highest point of the roof. The NESC considers a roof to be accessible to pedestrians if it can be casually accessed through a doorway, ramp, window, stairway, or permanently-mounted ladder by a person on foot who does not need to use extreme physical force or any special tools or devices to gain entry. 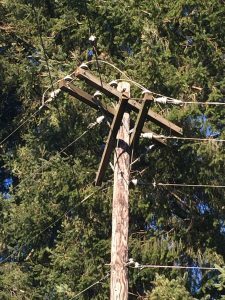 Electrical lines over roads can cause serious injury if a person, truck, or extension ladder come into contact with the charged line. 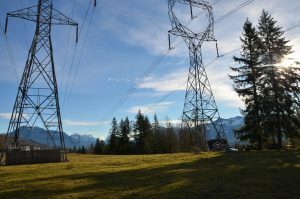 Because of the risk of injury posed by overhead electrical lines, the National Electrical Safety Code (NESC) publishes strict guidelines for height clearance over roadways. The NESC is published every five years by the Institute of Electrical and Electronics Engineers. The NESC creates rules and guidelines for electric supply stations, overhead lines, underground lines, and safety-related practices for utility workers. It is considered the industry standard for safety guidelines across the United States. The NESC may be adopted by state regulatory commissions. Although the NESC regulations are the industry standard, transportation departments, cities, and states may require additional clearances.